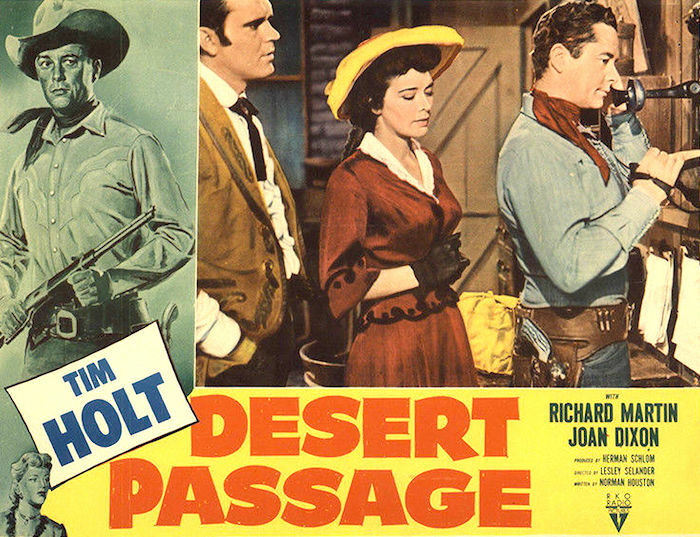 Richard Martin | 50 Westerns From The 50s. 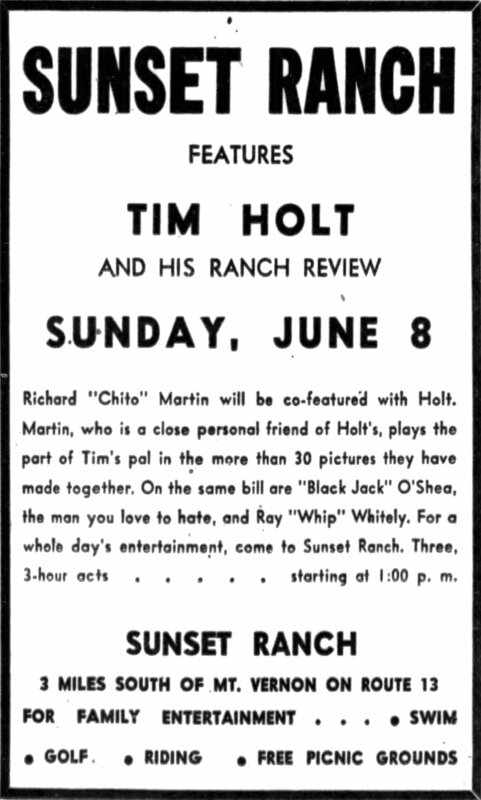 Tim Holt Tuesday #11: Behind The Scenes. 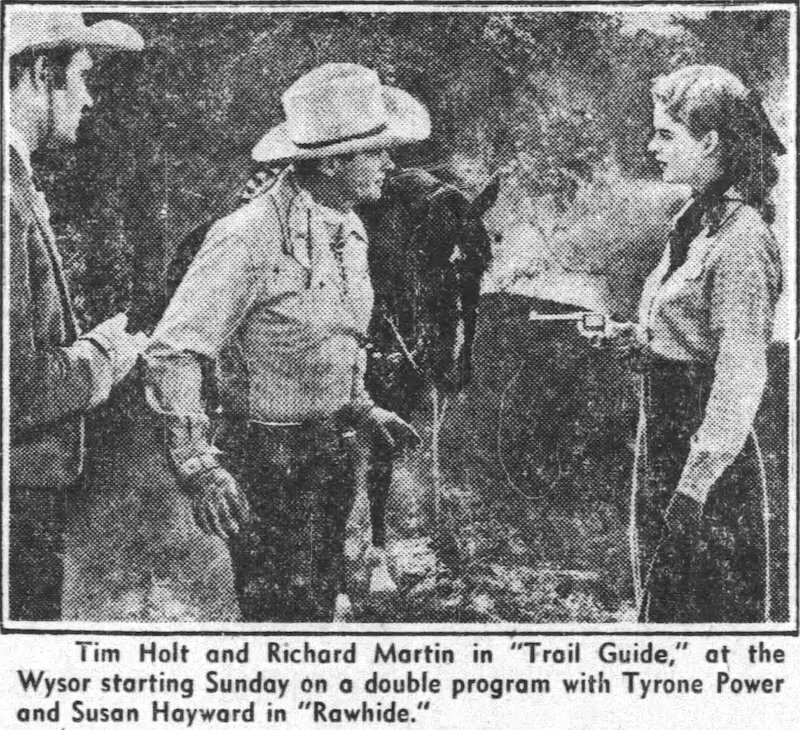 Noreen Nash, Tim Holt and Richard Martin on location for Storm Over Wyoming (1950, working title: Range War). 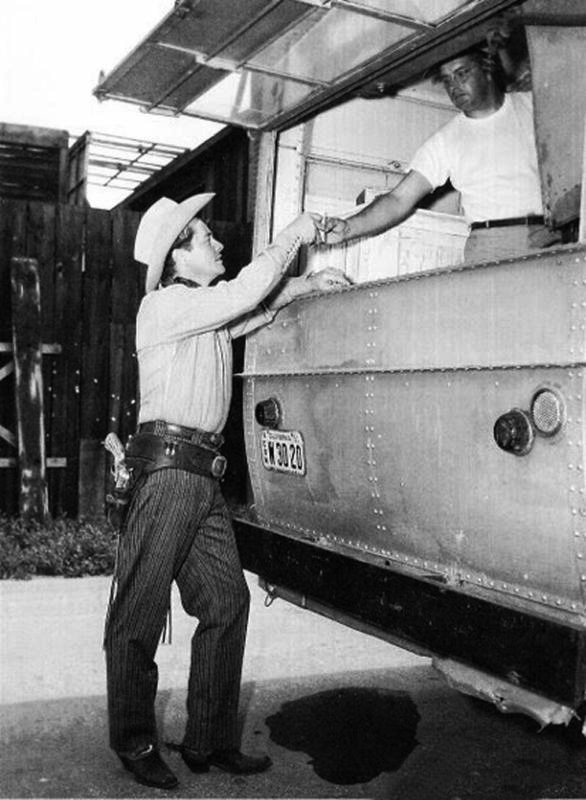 Lunch while shooting Border Treasure (1950). 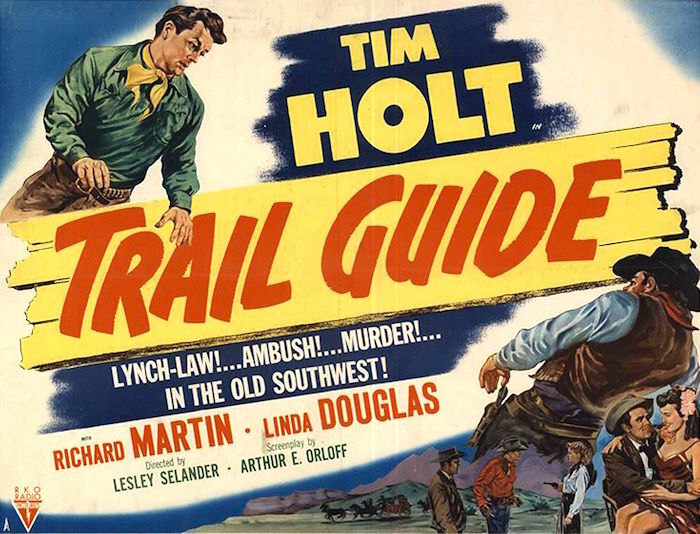 Tim Holt Tuesday #7/50s Westerns DVD News #145: Tim Holt Western Classics Volume 4. This is a big, big deal. 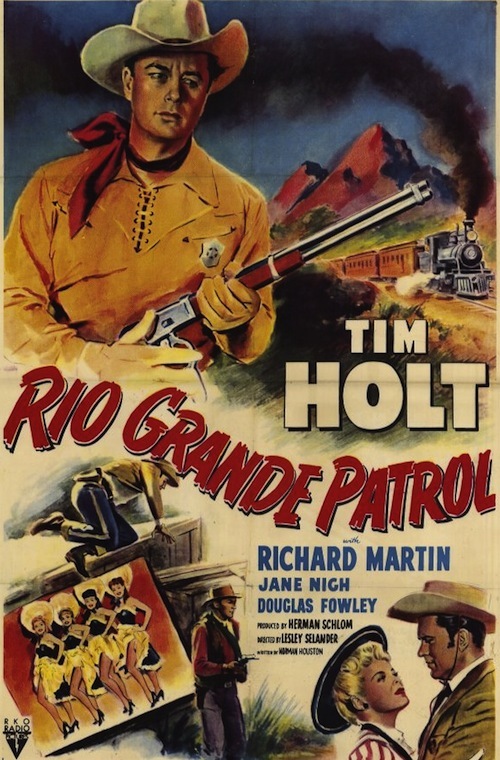 Warner Archive has come through with the fourth volume in their Tim Holt series, giving us the beginning, and end, of Holt’s time at RKO. 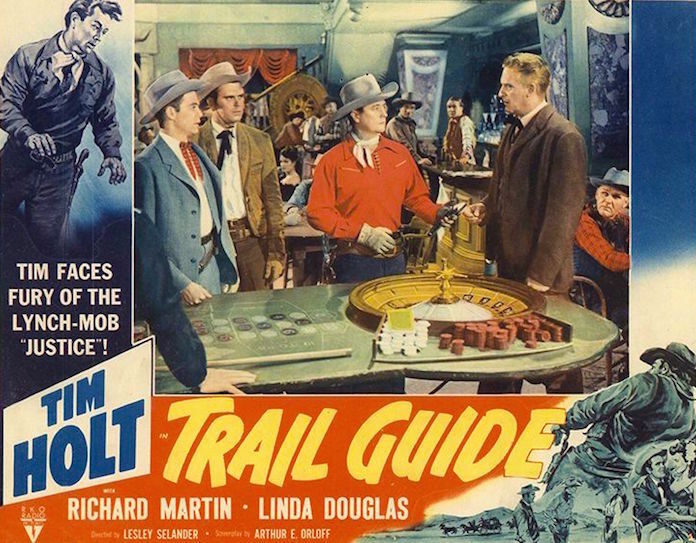 It’s a three-disc, nine-movie set that includes Wagon Train (1940, which got the series off to a terrific start), The Fargo Kid (1940), Cyclone On Horseback (1941), Riding The Wind (1942), Land Of The Open Range (1942), Thundering Hoofs (1942), Overland Telegraph (1951) and Trail Guide (1952). 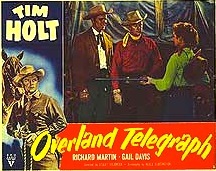 Overland Telegraph (seen in the Mexican lobby card above) is a particularly good one, giving Holt and Richard Martin a top director, Lesley Selander, and really good cast to work with: Gail Davis, Hugh Beaumont (as the bad guy! ), Mari Blanchard, George Nader and Robert J. Wilke. The set is available now. 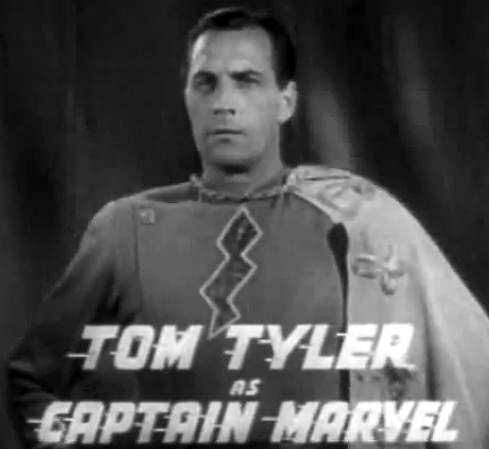 Thanks to everyone at Warner Archive for their dedication to getting these wonderful little films out there. 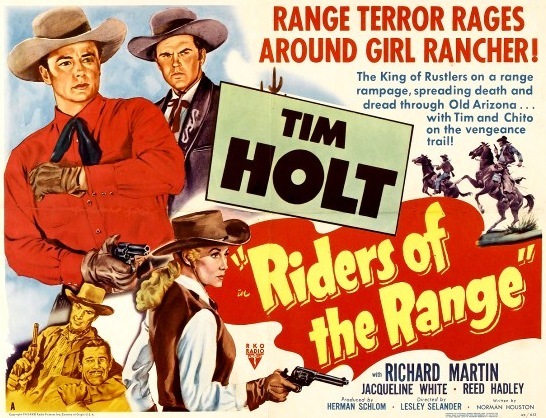 Tim Holt Tuesday #5: Riders Of The Range (1950). 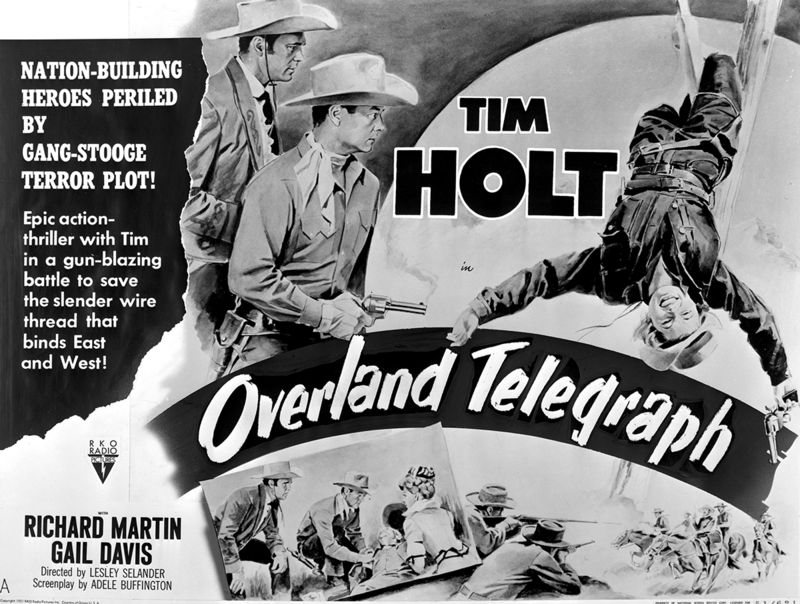 CAST: Tim Holt (Kansas Jones), Richard Martin (Chito Jose Gonzalez Bustamonte Rafferty), Jacqueline White (Priscilla “Dusty” Willis), Reed Hadley (Clint Burrows), Robert Barrat (Sheriff Cole), Robert Clarke (Harry Willis), Tom Tyler (The Ringo Kid), William Tannen (Trump Dixon). 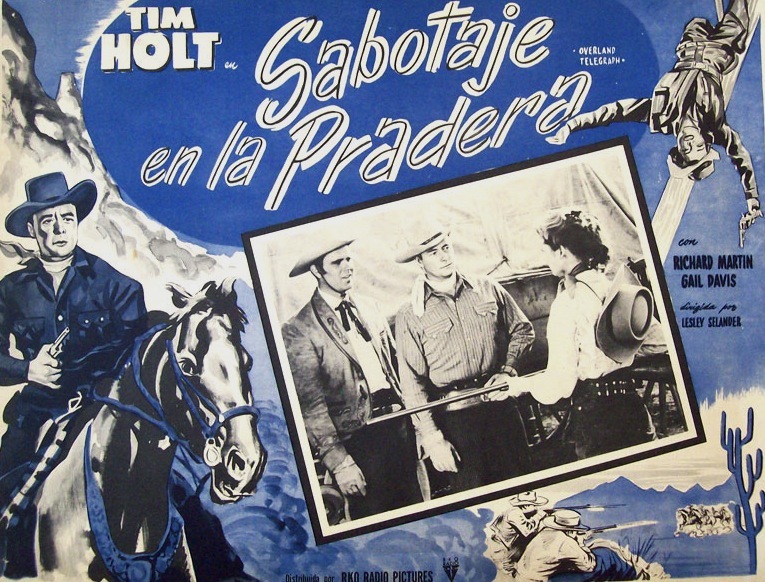 When unemployed cowhands Holt and Martin come to the aid of Dusty Willis (Jacqueline White) and her brother Harry (Robert Clarke), duking it out with saloon owner Clint Burrows, she gives them jobs on her ranch. Turns out Harry owes Burrows $3,000 in gambling debts, and Harry agrees to let Burrows’ men rustle some of his sister’s cattle to erase the debt. This kicks off a series of events that results in Holt being wanted for a murder he didn’t commit. 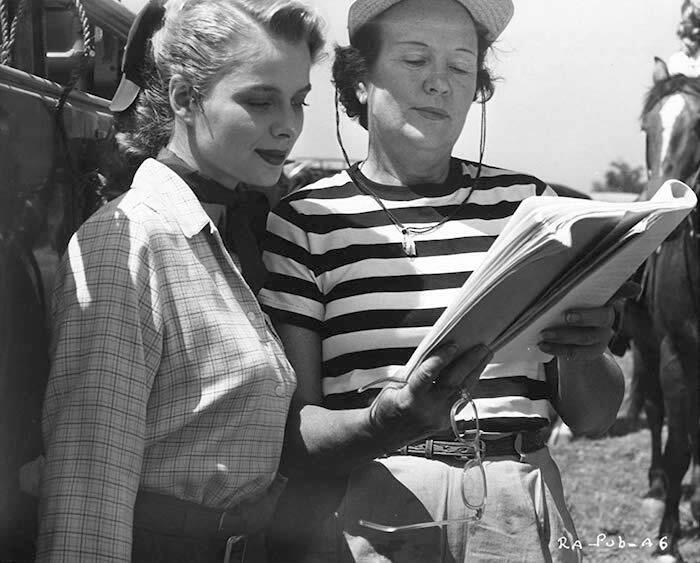 Riders Of The Range was directed by Lesley Selander (right), who did about 20 of the Holts for RKO. 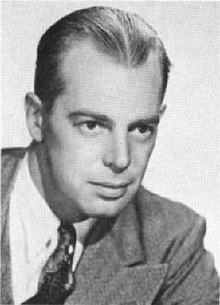 Selander worked his way up through the Hollywood studio system, from assistant cameraman to assistant director (learning a great deal from William S. Van Dyke on the Buck Jones pictures) to director. He did excellent work on the Hopalong Cassidy series for Paramount, signed on at Republic for a time, and wound up at RKO for the Holts. 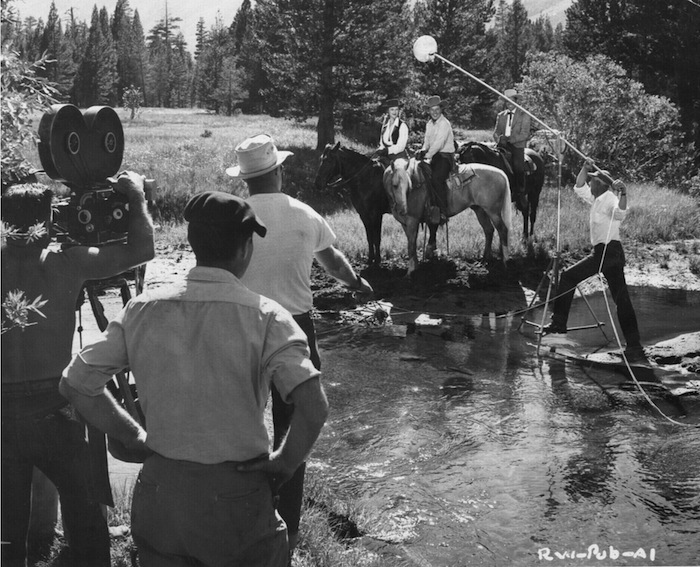 Selander worked miracles on the Holt films, turning out superior Westerns on RKO’s tight budgets (that were still more than other B Westerns were working with), getting plenty of production values from the incredible Lone Pine locations. 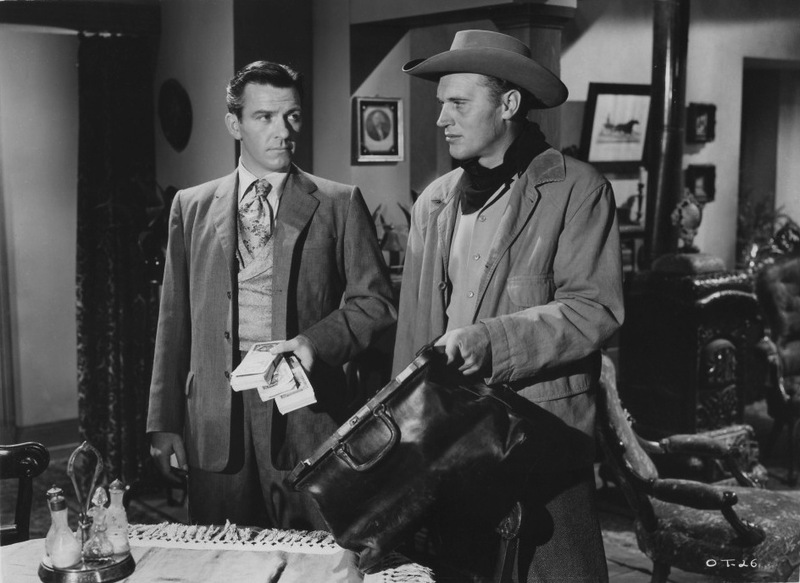 In fact, regardless of budget, his Westerns (such as 1948’s Panhandle or 1955’s Shotgun) are always a cut above. To me, Lesley Selander’s titles are the best of the Tim Holt series. 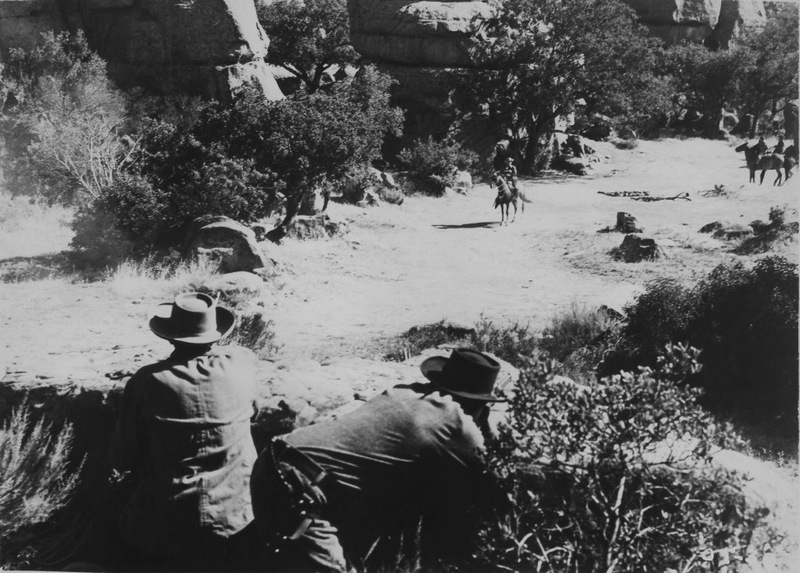 And Riders Of The Range is a good one, with his usual pacing and focus on almost constant action. There are a number of fistfights, a few gunfights and lots and lots of riding and shooting. Before you know it, the hour’s up and Tim and Chito are riding off. Jacqueline White has a nice part, too. 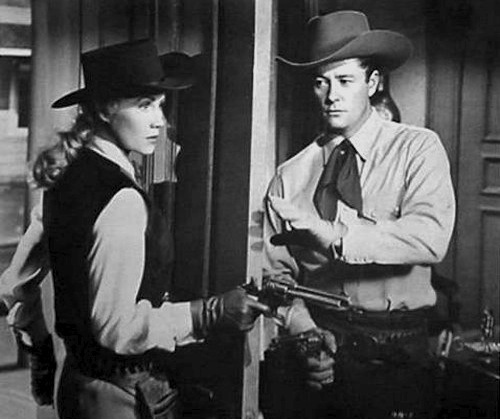 Riders Of The Range is the last picture in the Tim Holt Western Classic Collection Vol. 2 from Warner Archive. Like all the films in the three volumes (released so far), it looks terrific. J. Roy Hunt’s camerawork is startling at times, and the DVD-R presents it flawlessly.